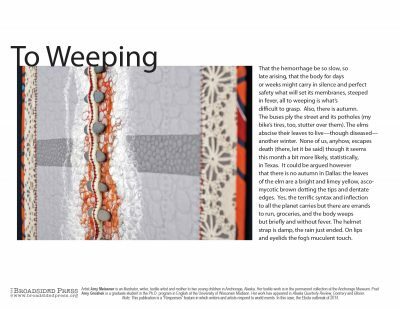 Artist Amy Meissner: The “Vein” textile series explores the juxtaposition between the natural world and the body. Veins run through rock, create fissures, weakness, but also immense beauty. Our bodies, too, are fractured in various ways, but still grasp at strength. The rise of illness, of epidemic, speaks to me in relation to this work, for I am always amazed at what topples this sense of strength, widens our own fissures—it’s real that something as small as a virus could leave nothing left in this world but stone. Poet Amy Groshek: When I was writing this poem, there was a lot of talk, both in the media and from government officials, about keeping Ebola out of the US. And of course that discussion mirrors others about immigration, language, and nationalism. But if you really paid attention to the news stories about our treatment of Ebola patients, it clearly wasn’t a virus that put us in the greatest danger. Rather, it was our own inability to reason and cooperate. I wanted to explore the paranoia evident in that discourse, and the vulnerabilities of the body—to infection, to language, to ideas, to fear. Meissner’s “Vein,” so suggestive of membranes and viscera, of the transgression of boundaries of all sorts, seemed to be asking the same questions. Artist Amy Meissner: I feel the role of writing and art in this case is to mark a moment emotionally. Unfortunately, emotion is difficult to contain and therefore results in more unsuccessful attempts at writing or creating art about political or catastrophic events. Creative work can come off as cartoonish or too literal or unintentionally persuasive when the creators are still in close proximity to a situation or too emotionally involved. On the flip side, to expect the luxury of time to bring us the same raw spontaneity of the moment is unrealistic. This is where I see conceptual art stepping in, playing a role as visual metaphor and allowing the viewer to bring his or her own experience to a piece. Do I have first-hand experience with ebola? No. But I have first-hand experience with fear and pain and a remote landscape that could so easily be cut off from the world should an epidemic arise. Poet Amy Groshek: Occasional poetry gets a bad rap. We forget that there was a time when pretty much every paid poem was commissioned, and commissioned poems were usually occasional. Predominant contemporary aesthetics aren’t very kind to occasional works, but we still sneak the occasioned-ness of our work into the poem in various ways, with dates, with place names, and with dedications. It is as though the poem itself wants to have happened in a particular place, at a particular time. It wants the rich sense of the local, with all the interesting ethical and affective concerns that locality raises. It is possible that poetry as a high art form is destabilized by the prospect of contingency, of utility, of locality within the form? Don’t get me wrong: it won’t all be great work. But it can’t hurt to keep the discourse as rich and responsive as possible. I think it was Blake who said that empire never did produce good poetry. (Don’t ask me for the citation on that one.) I’d like to push back against that sort of (totalizing) statement. Just as the body is always in some places healthy and in other places sick, so a geography may in some places house empire or privilege or the global North and in other places, a short walk away, house nothing of the sort. To resist at the same time as partaking may be more than a condition of modernity—it may be the human condition. If that is true, then occasional works have a very important and often unrealized role in our lives and our language. Image: “Vein,” 2014, Cotton, vintage domestic linens, wool, found objects. Hand felted, hand embroidered, machine and hand quilted. Photography by Brian Adams. Poet Amy Groshek holds an MFA from the University of Alaska Anchorage. She is a graduate student in the Ph.D. program in English at the University of Wisconsin Madison. Amy’s work has appeared in Alaska Quarterly Review, Contrary, and Bloom, and is forthcoming in Fence. Her chapbook, Shin Deep, was published by Finishing Line Press in 2008. Artist Amy Meissner with her collaboration, quilt, and wall of inspiration.